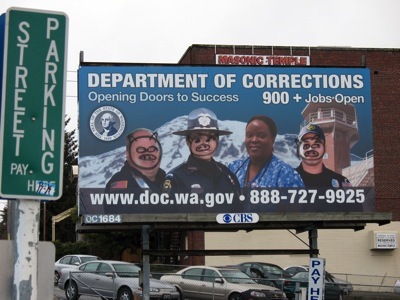 If the state Department of Corrections has been having trouble getting qualified applicants to staff its prisons, this clandestine artist’s social commentary probably won’t help. I understand the reference to “pigs,” although that pejorative is usually given to law police officers, not corrections officers. Interesting that the nurse was left untouched. Former Bremerton Beat blogger Steve Gardner said he noticed the graffiti this week. The sign, located of Fifth Street between Warren Avenue and Park Avenue, has been there about a year. 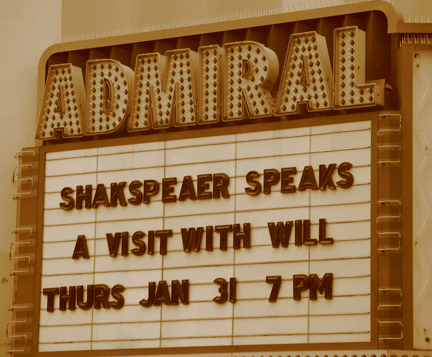 Like the Admiral Theater’s creative spelling of Shakespeare’s name, we’ll stay tuned to see how long it takes to clean this up. This photo was taken Wednesday afternoon. It took one passer-by a while to spot the error. “I guess I’m not a good speller,” he said. As the East African nation of Kenya teeters on the brink, another person from Kitsap County has found themselves amidst the turmoil. It’s been two weeks since Mark Clark has heard from his daughter, Tawny, 22, who has been traveling in East Africa and arrived in the capital of Kenya about a week after a disputed election there plunged the country into violence. The Pacific Lutheran University senior and 2004 Olympic High School graduate has been touring a few east African counties and is due back home Wednesday. She arrived in Kenya Jan. 6 or Jan. 7 and traveled to Tanzania and the island of Zanzibar as well. During the conversation about the parks levy last year, the mayor and council members would occasionally reference the street-repair funding mechanism that Bremerton could begin to consider using with the new year. That it wasn’t available until this year may have played a role into why the council decided to push a park-improvement tax measure to voters before streets. City council candidate Roy Runyon argued during his successful run for the council that the city should have made streets the top priority, at one point wondering if asking for park money would one day hurt the city’s chances of getting voters to approve of street funding. Streets are on the top of the list. The Legislature gave cities and counties the ability to charge $20 more on car tab fees generated within the city. The council can do it without a residential vote, requiring only a 5-4 vote from the council. It seems unlikely the council will do that, though who knows what kind of arguments can take place between now and the time the council makes a decision. The public input process begins Wednesday with a town meeting that will take place of the regular city council meeting. At 5:30 p.m. Public Works Director Phil Williams will lead a discussion of what the city can do to dramatically improve its efforts at paving city streets. The meeting will be in the Norm, in the first-floor meeting chambers. As you’ve traveled in Bremerton lately the city’s police department may have studied your movement through intersections. The city has been testing potential intersections for camera placement to catch and fine people who run red lights. Kitsap Sun reporter Josh Farley will be meeting with Bremerton Police Lt. Pete Fisher next week to get details on which intersections get the cameras and what the initial studies showed. We’ve heard rumors. If they’re true, ka-ching! The city will use the cameras for a month and send warnings, but after that the infraction costs $124. We’ve heard the city could have sent out a lot of tickets. “How many” you ask? “A lot,” I answer. We heard a number, but I can neither confirm nor deny, because the consequence of being wrong about it is just as excruciating as watching that guy on American Idol who had his chest hair waxed. Thank you, Newark. Let’s put it this way. Redflex will get just under $5,000 a month per camera, about $40,000 a month. Or, if there aren’t enough tickets issued, the company will get whatever amount the cameras generate. So the multiple choice question is, given the rumored number, would the cameras generate enough tickets to pay for themselves and provide revenue to the city? D. Oh my gosh, yes! This does not account for the fact that once cameras are up, people will be more aware and not so inclined to test it. But even if you cut the rumored number in half, the answer is still E.
I have more to do tonight and I’m getting in later tomorrow, but I saw this face and decided I’d better go home to do from there what else I’ve got on my plate. This is Madeline Lester. 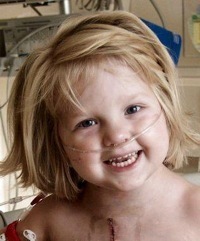 I don’t know her or her family, but she reminds me of the face I used to see smiling like that when she was 2 or 3. My daughter Sarah, my oldest, changed my life more than anyone I’ve ever known and I couldn’t be happier for it. I want to get home before she, now 9, has to go to bed. Madeline, according to the obituary, died on Jan. 16.